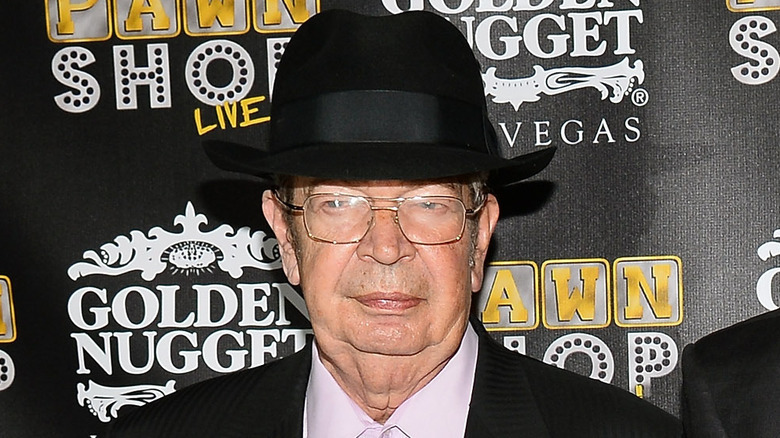 When Richard "Old Man" Harrison passed away from Parkinson's disease in June 2018, the Pawn Stars personality left behind a legion of grieving fans who'd faithfully tuned in to watch the reality show in which Harrison and his family were followed throughout their rather dramatic lives running the World Famous Gold & Silver Pawn Shop in Las Vegas. As one might guess given his nickname, "Old Man" was the patriarch of the family, overseeing the business while teaching his son, grandson, and others the fine skills of the pawn trade. On the show, Harrison earned a reputation for his no-nonsense attitude, his hardball bargaining style, and his ability to close a deal. But there's more to his story than just a tough military vet running a pawn shop off the Las Vegas Strip. His humor and cutting wit also became benchmark elements of the show, with the "Old Man" always ready to put in his two cents in order to bring an end to any tomfoolery… and leave us laughing. What better way to honor "Old Man" Harrison than to relive the good times by watching some of his funniest Pawn Stars moments? One of the best "Old Man" moments came when the pawn shop crew decided to have a Halloween costume contest. After some initial banter, a prerequisite for any conversation behind the pawn shop counter, the boys began revealing their costumes. Austin "Chumlee" Russell announced that he was dressed as pop star Justin Beiber (a true surprise, given that the costume was little more than a slender hoodie and a bad wig). "Beaver?" wondered the Old Man. "Beiber. The women go crazy for him," shot back Chumlee. "They go crazy over a beaver?" the Old Man responded. After a good deal of back and forth, he still couldn't get it. The humor didn't stop there. Next, the Old Man revealed that he wasn't Roy Rogers, which was Rick Harrison's guess — instead, he was none other than Rooster Cogburn, played by John Wayne in the 1969 film adaptation of True Grit — not the 2010 remake that Harrison didn't even know existed. The Old Man had no idea what he was in for when he casually asked his grandson, "Corey, what's Facebook?" The younger Harrison began to give a concise yet accurate description of building a profile and updating your status. He even included a cute little bit about how his current status could be how he was explaining Facebook to his grandfather. But the practical Old Man put the kibosh on the bonding moment by immediately announcing that it sounded like the stupidest thing he'd ever heard in his life, asking, "I'm going to sit at the computer and write down what I'm doing?" Corey attempted to dodge into safer territory by steering the conversation into how Facebook helps you keep in touch with your hundreds and thousands of friends, but the Old Man wisdom came crashing through again: Why don't you just pick up the phone and call your friend? Besides, how many of them would actually show up if you asked them to help you move? Words of wisdom from the older generation. In this episode, Chumlee and the Old Man both came in dressed as Santa Claus. Of course, the owner of the shop won out, sending the younger Santa packing. The only problem? The Old Man Santa Claus had much more of an Ebenezer Scrooge vibe — as he proved with his less-than-complimentary reaction when Chumlee returned with a new costume reminiscent of Will Ferrell in Elf. One of the funniest Old Man sequences took place throughout episode 2 of season 8 — which should come as no surprise, as the episode is literally titled "Grumpy Old Man." A fed up and frustrated Chumlee comes out swinging in an attempt to get the Old Man to stop being so mean to him. He decides that the best way to catch his grumpy boss "in action" is to record him with his cell phone, only to have the whole scheme go awry and end with Harrison in possession of his phone until "the end of the day." While the Grumpy Old Man vs. Chumlee duel is hysterical all on its own with the pawn shop owner lording it over his helpless employee throughout multiple scenes, the funniest point in the episode comes when Corey and his grandfather have a "Who's on First" moment behind the counter. The Old Man walks up to Corey bearing the confiscated phone and announcing that Chumlee got a text message. From there the conversation spirals as the grandfather and grandson descend into a futile effort to define texting abbreviations like IDK and OMG. The conversation once again reveals the eldest Harrison's old-school views and how little he appreciated the technological gadgets that the modern world has to offer. Though "Old Man" Harrison was quick to criticize anything with a shiny new serial number on it, that didn't mean he was above trying gadgets out occasionally. Such was the case when he went ahead and bought a smartphone without telling anyone else in the shop. Good for him, right? Wrong. The problem? He's still wasn't a fan of the darn thing and lacked the knowledge to use it properly. And sure enough, he let it get the better of him. When Rick Harrison and company discovered the patriarch's new gadget, they were shocked. But their amazement only increased upon further investigation, when they found that he'd called the pawn shop 27 times that day. The Old Man's reaction to the discovery was as calm as it was ridiculous: "Any phone that can mess with you is pretty smart." True, Old Man, true. What do you get when you combine an Old Man, a headache, and a bell? Primetime comedy, that's what. 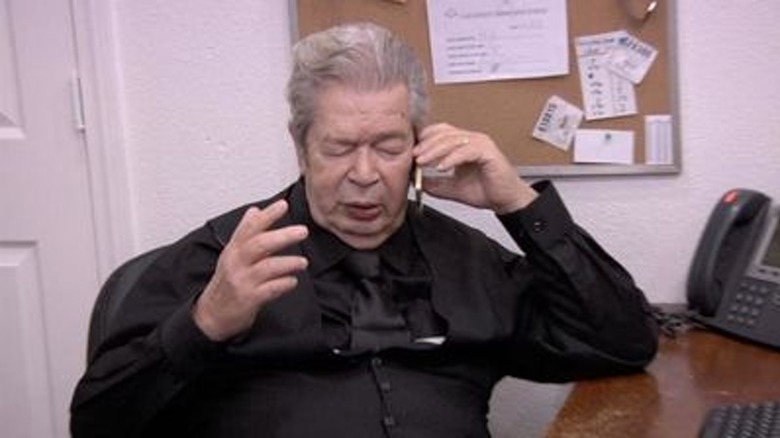 In this scene, Old Man Harrison was sitting at his desk back behind the counter nursing a headache when one of the professionals that the pawn stars bring in to verify purchases arrived. The man was coming in to check an old bell that Corey wanted to show him. After a brief hello to the pawn shop owner, who informed him that he had such a bad headache that he couldn't even get up to say hello, the professional and Corey got down to business up at the counter. Corey pulled the cord and sent the bell a-ringing. Normally, working pieces of history are as cool as they come, but not this time. With the bell still ringing in his ears, the Old Man hollered out for Corey to stop, but the grandson wasn't feeling particularly gracious — either that, or he was just really focused on figuring out this whole bell thing. Noting that he had a business to run, to which he got a curt "Oh, shut up," he turned back around and gave the bell another tug. Just another example of how the Pawn Stars family gets along so well. Every once in awhile, the Old Man could get pretty high-minded — especially with a cup of coffee in hand. In this instance in particular, the high-minded rhetoric was directly attributed to the coffee itself. When Chumlee brought the Old Man a good cup of joe, Harrison couldn't help but lower his guard for a moment and compliment the lad for his act of kindness. But of course, the Old Man wasn't just going to up and thank him — that would have been too nice. Instead, he started off with his definition of coffee, calling it the "nectar of the gods." The reference to Greek mythology having raised the conversation to a whole new level, he then proceeded to "confess" that Chumlee had actually made a good cup of coffee. Moving straight on past the compliment, he then proceeded to instruct his employee on how important coffee is for a well-rounded person, declaring that everyone, by law, should have to drink five cups a day. The best part, though, is at the end of the scene. After sending Chumlee off to go "please do some work for God and country today," he sips the coffee and makes a face that leaves you wondering just how good the stuff really is. Maybe he was just taking a break from his ongoing war with his oft-distressed employee/grandson's friend. While a lot of his best moments involved ribbing and playful frustration, every once in awhile "Old Man" Harrison got genuinely upset about something — such as when the rest of the guys staged a scene to make it look like they'd sold his rare Imperial, a car he'd been keeping in the back lot. They'd really sent it off to be fully restored as a surprise for their fearless leader, but it sure did make the whole gift that much sweeter when it came with the bonus of being able to work the Old Man up into a lather. Corey kicked things off by informing him that they thought it was going to sit in the back lot and rot, so they'd sold it for a cool grand. Chumlee then stirred things up even further by going into detail about what the new owner planned on doing to it, including plans to turn it into a low rider. The Old Man was livid, sounding genuinely angry on a level rarely heard on the show. He cursed up a storm and left the rest of the guys cracking up behind his back. When they surprised him with the restored car, he just told them to "get out of the way" as he got into his gorgeous set of wheels, looking like a kid in a candy shop. From "using a sledgehammer to swat a fly" to "Elton John specials," Richard "Old Man" Harrison had a saying for everything. Some of them were executed with precision and excellent comedic timing; at other times, he just left everyone in the room scratching their heads. For example, Chumlee and Corey both brought up in separate interviews the time that the Old Man used the quizzical phrase "Jesus Christ and a month-old baby." Rick Harrison commented on his father's strange ability to trot out an obscure saying for any situation, saying that the family always looked them up online to see if they were made up — and as it turns out, most of them were legit. It seems that often, the Old Man's southern heritage or his career in the Navy were the culprits. His habit of spouting these little catchy phrases led to multiple montages made by fans of the show, who refer to the sayings as "Old Man Wisdom" — but enough about the sayings. Let's quit "skylarking" and move along. Underneath that rough, dry-humored exterior, Richard "Old Man" Harrison really had a kind heart. This softer side of his personality was on full display when a woman came into the shop one day looking to sell her Musical Jolly Chimp — though the interaction was still laced with plenty of comedy to boot. It began with the Old Man comparing the monkey to Chumlee, declaring that they were cousins. When his employee started dancing and clapping in imitation of the toy, Harrison delivered a classic Old Man one-liner, declaring that he had a "mind grain." No, not a migraine, a "mind grain." Comedy aside, when the woman gave an asking price of $100 for the musical toy, the Old Man declared that he'd pay her $150 for it, as he wasn't comfortable paying just $100 for something he'd probably resell for triple that. Interactions like that are a big part of what made Harrison a beloved figure among Pawn Stars fans — it wasn't just his well-timed jokes and endless Old Man wisdom, but that soft side that surfaced every so often, reminding viewers that in addition to providing comic relief on a long-running reality hit, he was also a husband, a father, and a genuine person that was never afraid to be himself.